Sambisari temple is one of the relics of the glory of Hindu temples in Java which administratitf located in the district of Sleman, Yogyakarta Special Province (DIY). Syiwaistis temple built in homage to the X century by the dynasty dynasty was discovered in 1966 by accident by a farmer from the village named Sambisari Karyoniangun while digging in his field. Following up on these findings, Institute of Archaeology in Yogyakarta and then do research and excavations. Based on geological research on the rock temple and the land that has been hoard for hundreds of years, the temple is estimated as high as 7.5 m of material buried by the eruption of Mount Merapi in 1006 AD Furthermore, the results of excavations conducted in July 1966, ascertained that the area was indeed a temple site. At the time of excavation also found other historical objects, such as jewelry, pottery, and inscriptions made of sheet gold. According to the excavator, the findings indicate that Sambisari temple was built around 812-838 AD when Hindu Kingdom of Mataram (Mataram) was led by King Rakai Garung. After the excavation completed, began the process of rearrangement of parts of the temple which was scattered. Since then, the temple site is designated as cultural reserves. 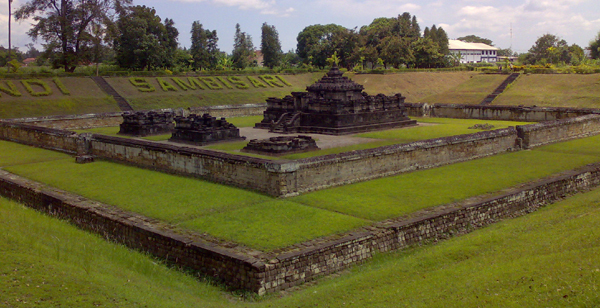 In 1987, the Yogyakarta Archaeological Center conduct the restoration and reconstruction of the temple complex. Of the reconstruction process, ascertained that the position of the temple is at a depth of 6.5 meters from the ground. Because of its position under the surface of the land, the surrounding community, then known as the Temple Sambisari underground temple. Compared with-cand Hindu temple in the land of the other Java, Sambisari temple has its own uniqueness, which lies beneath the surface of the soil as deep as 6.5 m. Thus, when visitors see it from the side, this temple as if emerging from underground.In terms of architecture, this temple also has a privilege, which can be seen from the parts that make up the whole temple complex. 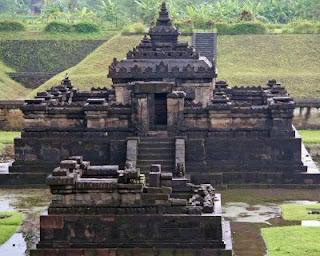 The main part of this temple has a height of 7.5 m, a square measuring 15.6 x 13.6 m. According to the Yogyakarta Archaeological Center, Temple complex Sambisari estimated size is larger than if carried out further excavations. But if done excavation again, it is feared the temple will be flooded when the rainy season, because its position is lower than the river located in the west. For visitors wishing to enter the main building, may be leading to the entrance located on the west side of the main building. During the climb the stairs to the entrance, visitors will find unique ornaments in the form of wings found on the stairs. At the wing tip the ladder, there are reliefs Makara supported by the two statues that resemble stunted creatures. Another uniqueness of this temple is not a pillar, so that the base also functions as a pillar. In this section there is a walkway that surrounds the body temple and has 12 steps. On the outside of the body of the main building of the temple, visitors can find niches as a place to put the statue. Visitors can see the statue of Goddess Durga in the north, the statue of Ganesha on the east side, and a statue of Agastya in the south. Two other niches that are on the right and left of the door, is where the statue of the god of the doorman, the Mahakala and Nadisywara. Unfortunately, the statue is currently not in place caused by the hands of people who are not responsible. Visitors can also find a statue of Yoni and Linga is large at a booth inside the body temple. Elain's main temple, the temple complex there are also 3 pieces Sambisari ancillary temples or accompanying temple is located in front of the main temple. Ancillary temple has an area 4.8 square meters and a height of 5 meters. While the exterior of the temple, visitors can see a wall made of white stone with a size of 50 mx 48 m that surrounds the temple. To reach the temple site is located about 12 km to the east of Yogyakarta city this or 5 km from the Prambanan temple, can be reached by bus Yogya-Solo majors until mile 10 where there is a signpost to the temple. From the edge of the road, travel about 2 miles longer be reached by motorcycle taxi. Because it lies in the middle of rice fields, around the complex Candisari can not be found supporting facilities are complete enough. Visitors can only find a few simple amenities such as food stalls, grocery stores, mosques, located in the township residents near the temple complex. For visitors who need accommodation facilities and a more complete, the nearest place to get it is in the city of Yogyakarta, which is about 12 km to the west. In this city provided the facilities are complete, such as hotels, restaurants, malls, international airports (Airport Adisucipto), means a variety of religious worship, beauty salons, cafes, art galleries, museums, and others.